The JST-SH connector is used on the Spektrum AR64xx and Deltang Rx33. Leads using this connector should be used with care: wires tend to be thin and the small grip area of the crimp will result in failure of the joint if excessive force is used to remove a connector. DO NOT tug on the wires to remove a plug, use tweezers to lever the connector shell out of the socket. For wiring information, see Micro Connection Wiring. 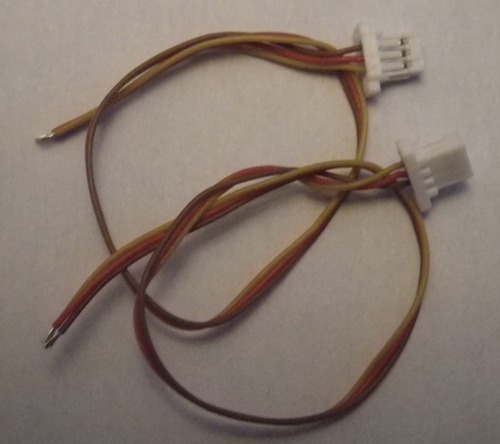 We can make lightweight servo leads using 32awg wire to the length you need - send us an email with length, type (e.g, extension lead, plug with bare ends, Y lead, ...) and quantity to get a price quotation. 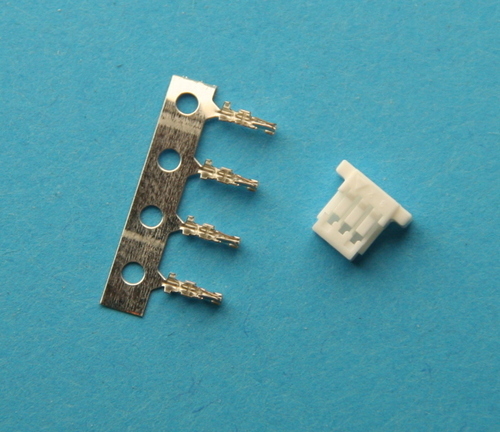 5 pack of 3 pin shell and 4 crimp terminals (one spare) to make a servo connector compatible with receivers that use JST-SH 1mm pin spacing connectors - e.g. Spektrum AR6400 and Rx33. 5 pack of 3 pin servo sockets compatible with the 1mm pin spacing sockets on the AR64x0 and Deltang Rx33 receivers. Although the socket is surface mount, it is possible to attach thin wires to construct an extension lead. The soldered connections must be protected with heatshrink sleeving. Use 32 awg servo wire, strip 2mm of insulation from the end of each wire, twist the wire strands and tin then place a 5mm length of 0.6mm heatshrink tube over each wire. Tin the socket tabs, and solder each wire to the top of each tab - with the tabs at the top of the connector and the socket pins facing away from you, the connections are (L to R): signal, positive, negative. Slide the heathshrink tube up to the connector body and shrink. Place a 10mm length of 3.2mm heatshrink tube over the connector body and shrink, pressing the tube down over the servo wire while it is still pliable; this will protect the solder joints. 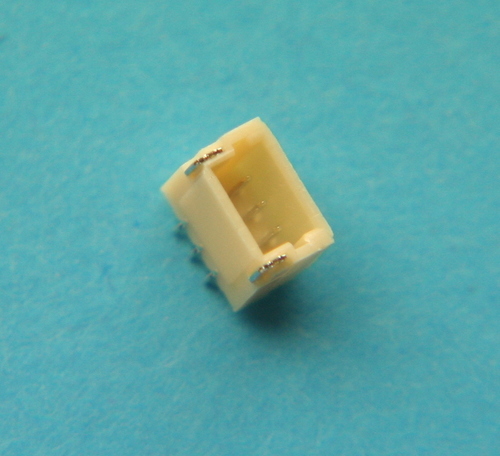 A JST-SH servo lead compatible with the 1mm pin spacing sockets on the AR6400 and similar receivers. The lead is made with lightweight 32awg wire and has a plug at one end and bare leads at the other. A servo extension lead can be made using one of the sockets above with solder connections protected using heatshrink tube. Although the image shows 2 leads, the price is for a single lead. A JST-SH servo extension lead compatible with the 1mm pin spacing sockets on AR6400 and DT Rx33. The lead is made with lightweight 32awg wire and has a plug one at one end and a socket at the other. A JST-SH servo Y lead compatible with the 1mm pin spacing sockets on AR6400 and DT Rx33. The lead is made with lightweight 32awg wire and the total length is 3 inch (75mm). This Y lead will fit the 1mm pin space JST-SH sockets on the AR64x0 and Deltang Rx33 receivers. The lead has a plug one end and two sockets at the other. The length of the Y legs and the plug lead can be specified, up to a maximum of 300mm each. Please specify the length of the Y legs and plug lead using the input boxes below. 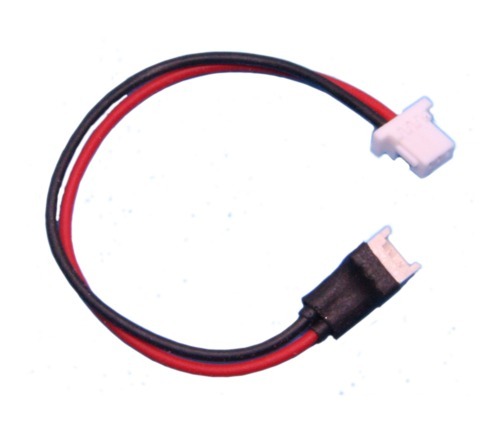 A lead for powering receivers with JST-SH sockets from a UM LiPo. The 75mm lead has a Molex 2 pin 1.25mm socket at one end and a JST-SH 1mm pin space plug at the other end. Suitable for the DT Rx33 or Lemon micro 6 chan.